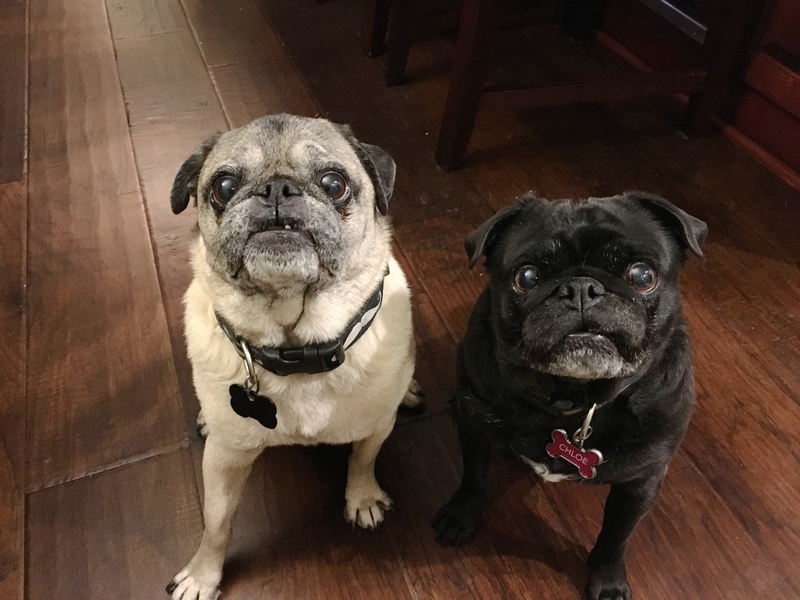 Chase (left) is a nine-year-old Pug who started marking in the house when his guardian became pregnant with their first child five years ago. Chloe (right) is an eight-year-old female pug who does not have any marking issues. When I arrived for the session I could see that the dogs had little self control. The jumped up on me, ran in little circles, cried and whimpered and shuddered while trying to claim me or get my attention. While its natural for dogs to get excited when a guest arrives, excitement should not override their ability to control themselves. Marking is often an offshoot of a dog who thinks it has more rank or authority than it actually has. This is usually the case for dogs who don’t have much in terms of rules and structure in their day to day life. Dogs probe to test boundaries and limits and when we don’t have any rules in place, this cases the dog to infer that there is a leadership void, so they try to fill that position themselves. Other factors that can impact marking behaviors are changes in the home environment; specifically the addition of new people or dogs. Because this marking started when one of the guardians was pregnant and after adding a second dog to the home, its possible Chase was a little insecure and started marking to compensate. The way I prefer to stop a dog from marking is to change how the dog perceives itself in conjunction to the people and dogs it lives with. Once a dog sees and identifies as being a follower, it would seem inappropriate to mark inside in the same way. Because security for the pack is a task that is generally handled by the authority figure, removing this job from Chase is an important part of the rehabilitation process. We had arranged for the guardian’s mother to return with the family’s children about an hour into the session which provided me with an opportunity to show them how to claim the area around the door. By moving the dogs away from the door before opening it, we can help the dogs understand that we are in the leadership position for this exercise. The added distance helps the dog’s react less intensely to the arriving guests. Asking the dog to stay behind a boundary on their own using body language and movement is a great way for the dogs to practice a little self control. After demonstrating how to claim the door area this way, we had the family’s father head out to play the part of an arriving guest so that the mother could practice claiming the area around the door personally. I suggested that the members of the family call or text one another when heading home so they can help each other practice answering the door this way. It usually only takes a dozen or so repetitions before the dog understands the new rule and stays behind the boundary away from the door unprompted. After we wrapped up the door claiming exercise, we sat down to chat some more and I noticed that the family’s mother petted the dog each time it jumped up, barked at or nudged her for attention. While this action is ok for a balanced dog, letting a marking dog tell you when and how to pet it is a recipe for problems. Essentially this tells the dog that is can give the human orders; in this case, pet me! That’s something only a leader should be able to do. To help put a stop to this issue, I showed the guardians a method I like to call Petting with a Purpose. By consistently asking the dog to do something, especially something that helps the dog adopt more of a follower posture or position will help change the dog’s perception of rank or authority amongst the humans in the house. It will take the humans a few days to a week or so before this becomes second nature to them. Once that is the case, they will be unconsciously reinforcing the leader follower they want every time they pet their dogs. Just as we were wrapping up the petting exercise, I noticed that each time I petted one of the dogs, the other came over to try to get some of their own. This is a gradual activity that most people don’t even notice developing. By only petting the first dog to come over, their guardians can get the dogs to start competing to get a reward for being obedient rather than competing with the other dog for the human’s attention. This may not be directly related to marking, but the underlying mindset most assuredly is. Next I went over some new ways for the humans to communicate and disagree with the dogs. Often people use too many words or fail to properly teach them to their dogs or do a poor job of associating it to the desired activity or behavior. By using non verbal communication cues that mimic how dogs interact and communicate with one another, we can make it easier for them to understand us. To help the humans practice using these new communication cues, I demonstrated a Leadership Exercise I developed a few years ago. In addition to helping the humans practice using the cues, it helps the dog learn to develop better self control and respect for the authority of the humans. After Chase seemed to understand the exercise, I coached the family’s mother though it. The mom’s timing and technique were a little rough at first but improved as we practiced. One thing she will need to work on is her hissing sound. She consistently skipped the hiss and moved right towards stepping at the dog. But the idea is to always start with the hiss and turn up the intensity if the dog fails to listen to it. There will be occasions where she will need to move past the hiss sound, but if that is always her starting point, eventually the hiss is all she will have to do. One other piece of homework for the mother is to work on the volume and intensity of her hiss. She consistently hissed at such a low volume and intensity that the dog often ignored her. I suggested that she practice various levels of the hiss when out driving so that she can match the dog’s energy level in the future. Next up was the family’s father. He had been gently ribbing his wife on her timing and technique, so perhaps it was karma that sprung up to throw him a monkey wrench his first time running through the exercise. I recommended that the guardians practice the leadership exercise with both dogs separately each day and went over how to make it more challenging once the dogs start to get bored. By practicing the exercise daily and increasing the length of time we ask the dog to self restrain, we can help it build up more self control and respect for the authority of the human leading the exercise. I wanted to end the session by showing the dog’s guardians how to add structure to their feeding ritual. After we finished, the family’s two daughters joined us in the kitchen for a snack. We used this opportunity to put some of the new techniques and methods we had introduced earlier into a real world application. By the end of the session, the Pugs were pretty exhausted. We probably used their brains more in this session than they had on their own for a long, long time. But the good news was I could already see signs of improvement. The dogs were not as excited in their interactions with the humans. They still challenged a few of the new rules, but were pretty easy to disagree with or correct when they did. By enforcing the new rules and immediately disagreeing with the dogs when they break them, the guardians will help the dogs start to see and identify as having less authority. Combined with Petting with a purpose and assuming the leadership role in activities like answering the door, Chase’s marking habit should subside and eventually stop completely.